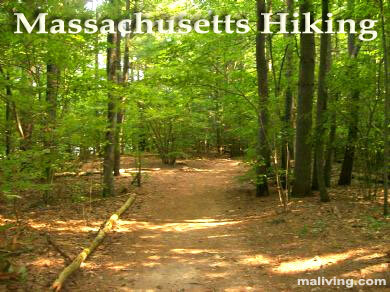 Central Massachusetts offers hiking trails for all ability levels. Hike across rolling countryside, through urban centers and up to mountain tops. Enjoy an afternoon outing or extended stay along the trails of Central Mass. Let us know about your favorite Central Massachusetts hikes and trails by contacting us. Learn more about advertising in MALiving.com. The midstate Trail extends from Rhode Island across central Massachusetts and into New Hampshire crossing woodlands, lakes, farmland, and rolling hills. The Metacomet-Monadnock Trail begins in Connecticut and ends in New Hampshire. Within Massachiuusetts it offers a more challenging hike across the Mount Holyoke and Mount Tom Ranges. The Norwottock Rail Trail is located within Massachusetts’ Connecticut River Greenway State Park along the former Boston & Main Railroad. The trail crosses the Connecticut River, and winds through forests, farmland, and towns. This paved trail is ideal for all levels of ability.